Here are the message and announcements for Apr 29 2017. 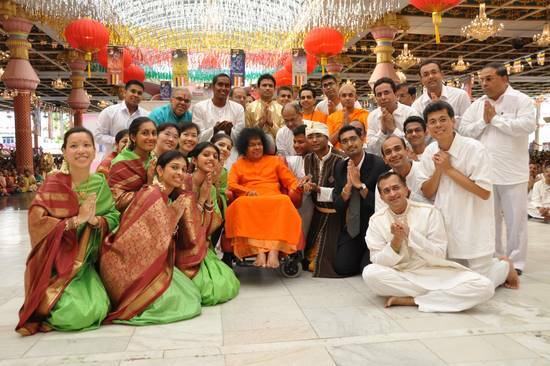 Our Humble Pranams at the Lotus Feet of our Divine Mother. "If you are careless about the discipline of truth, every duty laid on you by dharma and every action prompted by dharma will hang heavy as a burden. Hence, you must search for the reality behind all these phenomena in your daily living, and that search will make all your duties, which are dharmic actions, light and pleasant. The Lord has designed people such that they are inclined towards God and are delighted at the expansion of their vision, and are happy when they are moral and virtuous. So, people must serve their own best interests by adhering to their basic nature, by concentrating on the Divine (Brahman), by assiduously cultivating truth, and by rigorously practicing right conduct (dharma)." The next weekly Monday bhajans will be held on 5th June 2017 on the 2nd floor of Sri Senpaga Vinayagar Temple, 19 Ceylon Road from 7.15pm to 9pm. All are welcome. Veda Lessons and Bhajan Training will be held on Saturdays, the 3rd, 10th & 17th of June from 5 to 7.15pm in this temple. Chinese Bhajan training will be on the 10th & 17th of June from 5 to 6pm. 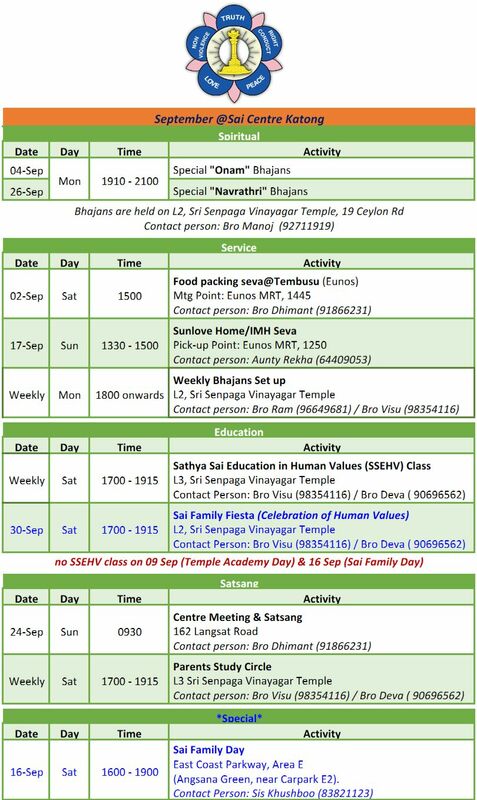 For Veda lessons, please contact Sis Sudha (9673 1641) or Sis Shyamala (9186 0742) & for Bhajan training, please contact Bro Lakshman (9239 2689). All Students, Parents & Gurus are welcome. A Young Adults Seva session will be held this Sunday, 4th of June form 8.15am to 12 pm at the Willing Hearts Soup Kitchen, 11 Jln Ubi Blk 6 #01-51 Kembangan - Chai Chee Community Hub S 409074. Please come dressed in modest attire. Please also wear closed- toe shoe. If you would like to attend this seva, please let Sis Vanisha (9092 9329) know by the 31st of May. A Gramma seva where items such as clothes for adults & children, toys, bags, bedsheets, stationeries and food items are distributed to some villages in Batam on the 3rd Sunday of every month. If you would like to donate any of these items or attend this seva, please contact Bro Ram (96649681) or Bro Gulaab (96238981). Sai Centre Katong has setup a special whatsapp group to motivate all devotees to practise daily Sadhana - Gayatri Mantra chanting and Silent sitting as a family. Devotees who are keen to practise the sadhana will be added to the whatsapp groups. We offer this Sadhana at the Feet of our Divine Lord. For more information, please contact Bro Vijay (96447259) or Bro Dhimant (91866231).